Sam has been working as a professional makeup artist for 15 years. She spent her work program in highschool working at Toni and Guy, where she was a receptionist. Upon recognizing her raw talent, the owners offered her a position as a weekend makeup artist. After graduating high school, she moved to New York City, where she began a makeup artistry apprenticeship and worked as a full time artist at the city’s 5th Avenue flagship location of Ricky’s NYC. To be closer to family, and explore a new opportunity, she moved to Fort Worth, TX and began her career at MAC Cosmetics. There she truly developed her individual point of view as an artist and truly grew into her specific style. It was in the retail environment at MAC that she discovered her passion for training and instruction. She is deeply passionate not only about makeup application, but also in her innate ability to empower her clients to understand their own face, their specific needs, and their vision for themselves. After an amazing 6 years at MAC, working alongside some of the most talented artists in Texas and building an incredible clientele, Sam left the company to focus solely on her freelance makeup career. Since then she has done countless wedding parties, proms, formals, portraits, and every type of occasion in between. She has worked with many brands and companies, collaborating on print and digital advertising as well as live showroom and runway. She has done both beauty makeup and special FX for film and television, allowing her to perfect the application needs of HD makeup. 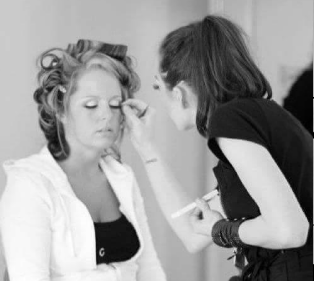 During lessons, Sam is able to help a client to clarify a realistic and clear daily makeup for themselves, direct them towards specific products and tools to achieve their desired look, and then give them the hands on instruction necessary to turn the power back over to them for the longterm. She uses these same techniques to teach hopeful makeup artists how to understand makeup for any face or occasion, the business, and how to build their own kit. In 2017 Sam moved back home to Weatherford, TX with her boyfriend, Sean, and her two rugrats, Charlotte and Georgie. Eager to work in a team environment again and blessed by the opportunity, she joined the family at 1st Revelation. She’s continually inspired by the incredibly talented artists surrounding her, and is super excited to bring another art form to the shop!